The Ainu people lived in the northern regions of Japan and in parts of Russia. They were a fair-skinned blue-eyed people. Most say that the closest Ainu relatives are from Tibet or the Andaman Islands off of India, although testing has shown that they could have descended from several other groups as well. The Ainu speak their own language, Ainu. It is known as a language isolate, having no known relationship with any other languages. It is a language unique to the Ainu culture and people. The Ainu's first contact with the Japanese was around the 13th century. Between the 1600s and 1800s the Ainu traded with the Japanese. They increasingly became dependent upon the Japanese and this led to several Ainu revolts. The Japanese also brought disease into the Ainu people. 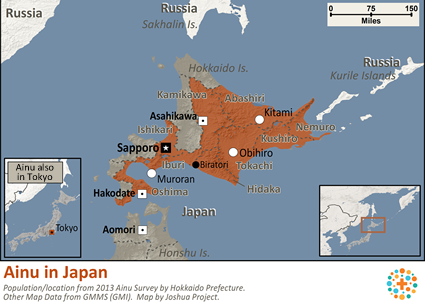 During the Meiji Restoration the area where the Ainu lived (Hokkaido) was annexed. Land was taken from the Ainu. The Ainu were labeled "former Aborigines." The result was the loss of their autonomy and indigenous standing. The assimilation into Japanese culture had begun. The Ainu people were not officially recognized or restated until June 6, 2008. The Ainu were originally fishermen and hunters. The Ainu lived off of bear, fox, wolf, fish, vegetables, herbs, and roots. The men ate with chopsticks and the women ate with wooden spoons. Their homes were huts located beside water. Each Ainu "village" consisted of 4-10 families. The average age of marriage was 17-18 for men and 15-16 for women. When children were born they were not given names until around 2-3 years old. The word Ainu means, "Nature." The word "Kamuy" is used for everyday things and also things beyond their control. These gods include animals, household objects, and nature. The hierarchy of the religion consisted of grandmother earth (fire), mountain animals, sea animals, and finally everything else. The bear held a special place in the Ainu religion. Ainu sacrificed animals. Also, tattooing was a part of their custom. Many woman from a young age started tattoos around their mounts. During the Meiji Restoration, they were forced to leave behind animal sacrifices and the art of tattooing. 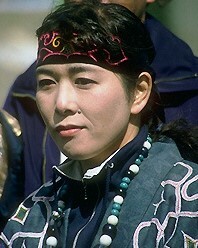 The Ainu are often marginalized in Japanese society. It is estimated that there are only 15,000-24,000 Ainu remaining. Their language is also disappearing. It is on the endangered language list. Their greatest need today, besides a Savior, is the preservation of their traditions. * Pray that the Ainu language would be preserved and that those who still speak the language would have the opportunity to hear the Gospel. * Pray that those who still practice the Ainu religion would come to know and worship the one, true God. * Pray that God would raise up Ainu leaders who would help preserve the traditions and at the same time introduce Christ. http://goo.gl/PFlTZView Ainu in all countries.